What types of tools could you expect us to use when opening up your home, office, car or safe? There are a variety of tools we have at our disposal to help us in the effective opening of a wide range of locks including 001 dead latches, cylinder / lever mortise locks, automotive locks and safes. 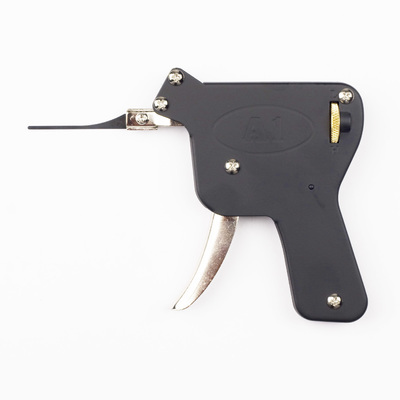 "This is the type of pick gun that we use at Strathfield locksmiths"
This is the most commonly used tool that we rely on at Strathfield 24 hour Locksmiths; we use this piece of equipment daily at least 5 times daily. It’s important because it assists us in damage free gain entry on a variety of inline cylinder based locks such as 001’s, knob sets and 570 mortise locks which are commonly found on homes and offices. The principle behind the pick gun, or snap gun as some in the industry call it, is that it bounces the tumblers in a “random fashion” that when coupled with a “turning tool” or “tension wrench”. It aims to lift each tumbler to its necessary height whilst the turning tool aims to catch each tumbler at the necessary height without it falling back down. The tumblers are under spring pressure and the older the cylinder the harder it can sometimes be to pick because the mechanics are not as free flowing in a new or less worn cylinder. The pick gun has an adjustable dial that increases or decreases the pressure of the snap to assist us in successfully picking your lock. We have supplied a picture of one for all of those curious to know how we will approach your gain entry job. This tool acts as the “key” and is responsible for turning the plug when a lock has been properly picked. The tension on the tool needs to be adjusted alternating between heavy to light pressure. It’s different for each lock but we are experts at gain entry and we can feel how much pressure is required assisting us to pick 90% of the locks we face. Our astoundingly high rate of successful lock picking comes from years of experience. Be wary of a technician that walks up to your door telling you it needs to be drilled, as a guide you should expect one to attempt to pick your locks for up to 5 minutes before making the decision to drill. Drilling is a process that DOES NOT damage the door or lock. It only requires a new cylinder to be inserted after the drilling process, of which we always have them in stock so you never have to go without proper security. The plug spinner is a handy tool which helps us spin a barrel the other way should we have picked it to the wrong direction. For example with deadbolts, such as a 355, it’s possible to pick it the wrong way, but using the plug spinner means we don’t have to reattempt it, we can just spin it past the point where the tumblers engage the plug, allowing us to open your door quickly. In addition to gain entry we also offer the full range of lock and key services including installation, service and rekeys. When wee rekey your locks we take the utmost caution by introducing a new key into your lock with vastly different cuts to ensure you are getting the best possible job. This means you will always benefit from the highest level of security your locks can deliver.